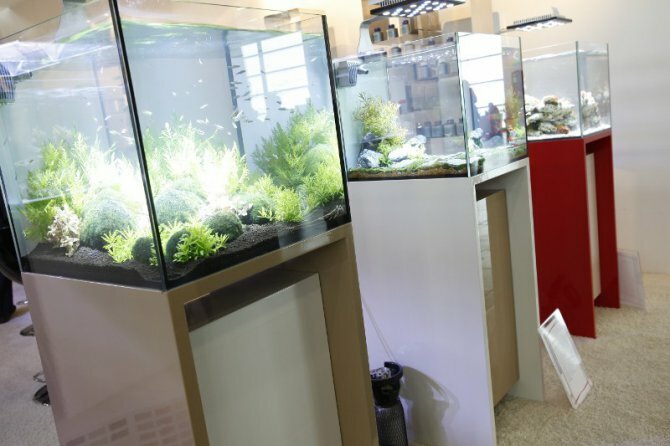 Looking around the Interzoo 2010 trade fair in Nuremberg, Germany, it looks like we may soon see some new trends arriving in aquarium and cabinet design. Aquarium design has moved on quite a bit in recent years. It wasn't that long ago - maybe just 10-15 years back - when many of the tanks sold in the shops here used to be rather more ugly. Most were simple all-glass jobs with a flimsy black aluminium hood and maybe a black plastic coded metal stand. If you had a tank on a wooden cabinet it would be made of cheap-looking melamine and look a bit tacky compared to the rest of your furniture. However, judging from some of the tanks and cabinets we saw at Interzoo, this may be about to change. A large number of those on offer were open-topped, and had the modern brace-less and rim-less design; the glass was neatly finished at the edges and you couldn't see the silicone sealant smeared between the individual panes. Cabinets seem to be switching from the beech and birch colours of a few years ago to different oaky finishes, as well as darker woods, but it's the lacquered ones that caught my eye. Several companies including Tech2o-Lab were offering tanks with a smooth shiny single-colour finish, and their Xaqua range was among the nicest. Maybe we'll soon see these features into the more widely sold tanks available in UK shops? It certainly seems that the innovators from Interzoo 2008, such as Italian manufacturer Elos, had provided inspiration to others, so maybe Interzoo 2010 will see floods of these. While that might not be innovative, it will mean that the tanks we get over here start to look even better.